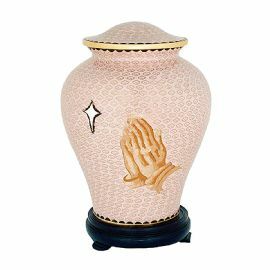 The Praying Hands cloisonné cremation urn is crafted in the shape of a traditional style vase with a hand-applied enamel and a wooden base. It has a threaded, top-opening lid. Cloisonné cremation urns are made from metal that have a decorative enamel finish. Cloisonné is an ancient, Near East metalworking technique used in the decorating of metal objects. The first recorded use of the cloisonné technique was in Ancient Egypt, but was also popular during the Roman and Byzantine Empires. The Chinese, however, made the cloisonné technique famous in the modern world, since the most elaborate and highly-valued cloisonné pieces are from the early Ming Dynasty. Because cloisonné urns are beautiful pieces of artwork, we recommend that they be kept at home. However, cloisonné urns can also be entombed in a cemetery columbarium niche or buried in an earth grave. Please note some cemetery regulations may require that this urn be placed inside of an urn vault prior to earth burial.